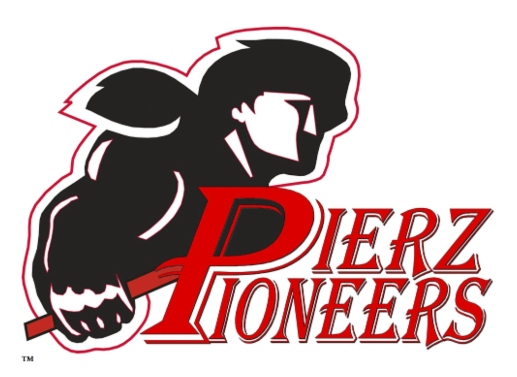 Academic programs at Pioneer and Healy run the full gamut - from helping struggling students, to advanced programs to enrich learning, and even providing college courses at no cost to students. 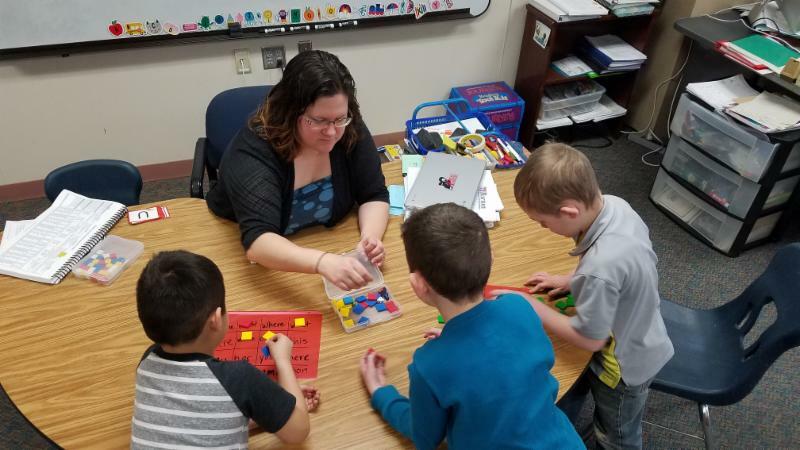 This week we will introduce you to the new academic programs that are empowering students at Pioneer Elementary; next week, we will showcase the ways Healy students are learning, including Ramping Up, College in the Schools, and the hands-on agriculture and industrial tech programs! The upcoming referendum on April 10 seems like it’s a long way off, but absentee voting begins Feb. 23, and we want voters to have as much information as they need to make an informed decision. A referendum is a complicated thing to communicate. We’ll be providing information in many ways, but it all comes back to our website. It will have the most comprehensive information, and it will be constantly updated with answers to questions we are hearing from you. The website is now live. Here are some highlights. Click the headlines for more details. 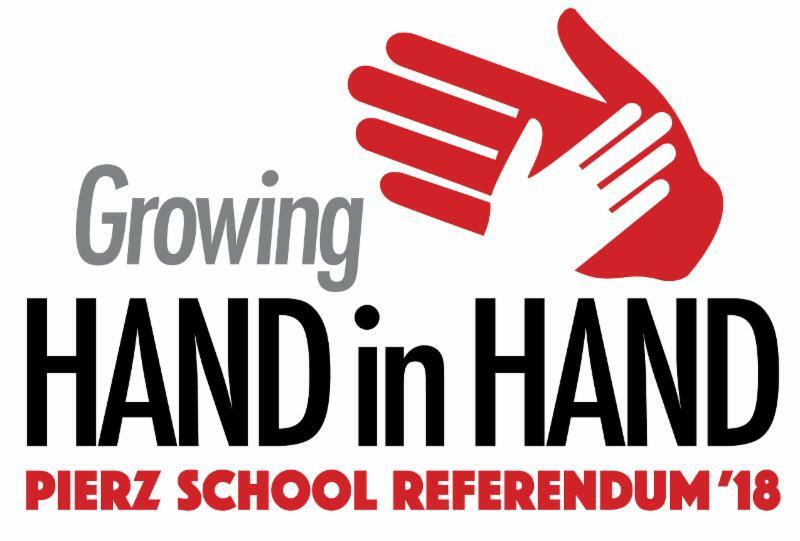 This is a downloadable overview of the referendum, with summary information about why the referendum is proposed, how students would benefit and when the vote takes place. This section of the website has information on facility needs, including inadequate or non-code compliant facilities and space issues. Here we provide a breakdown of the solutions, including a site map of what the buildings would look like if the referendum is approved. Learn where and how to vote, either early or on Election Day, and see the official ballot language. 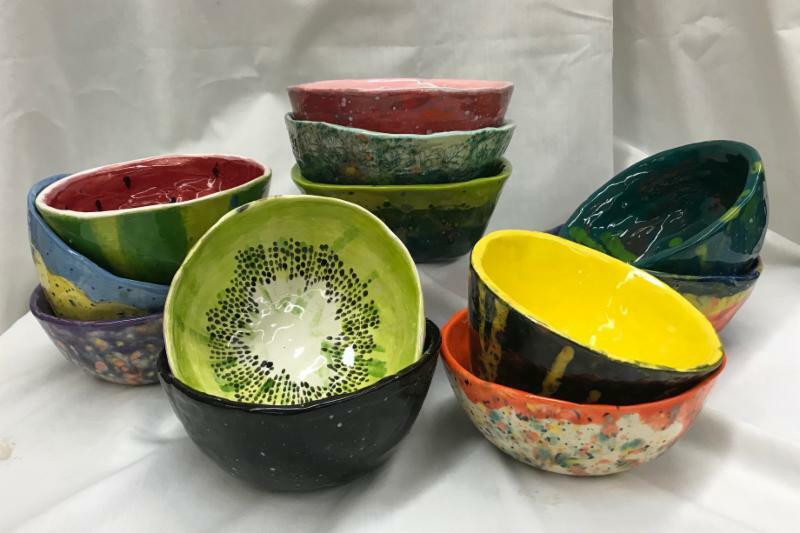 Mrs. Underhill's Art Club students have been working hard, preparing for the annual Empty Bowls Soup Supper Benefit on February 21 from 4-7pm. They've spent countless hours (and even some weekends!) making the handmade bowls you'll be able to purchase and fill with delectable soups made by Mrs. Athman's Foods Class students. $10 for the beautiful bowl filled with soup, including bread and a beverage. Empty Bowls is a special community project and event designed to build awareness and develop support for fighting hunger in our area. Students in grades 5-8 from Healy and Pioneer participated in the first round of the official Scripps Spelling Bee. For the district, Silencia Algarin placed 3rd; Caleb Kuske was second; and the winner of our district was Lynn Skiba. Both Lynn and Caleb have also been invited to the Lakes Spelling Bee on March 7 through NJPA where they will compete with other mid-Minnesota district winners for a chance to move on from there to the national level in Washington D.C. Congratulations! 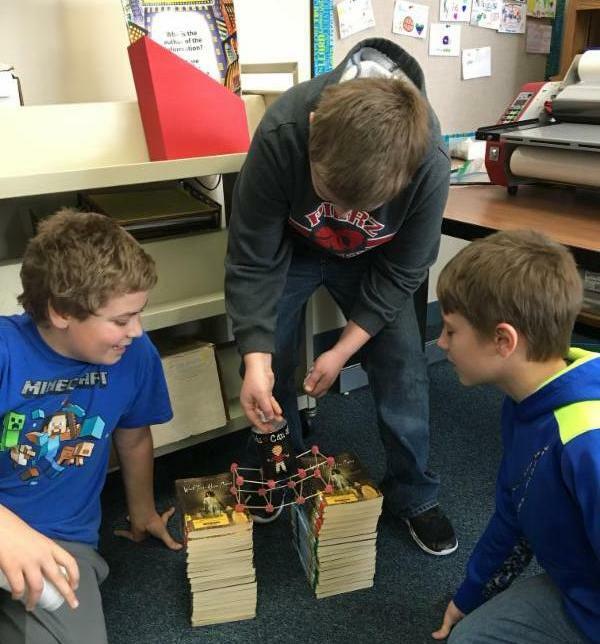 CSI Students Keep Us Connected! 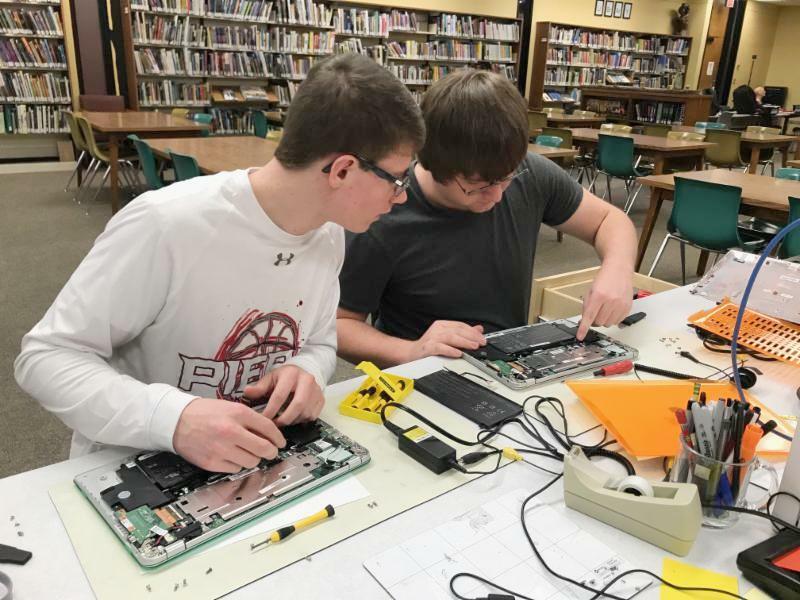 Students in Mrs. Welle's CSI course (Computer Support Interns) repair student Chromebooks, keeping everyone running smoothly. 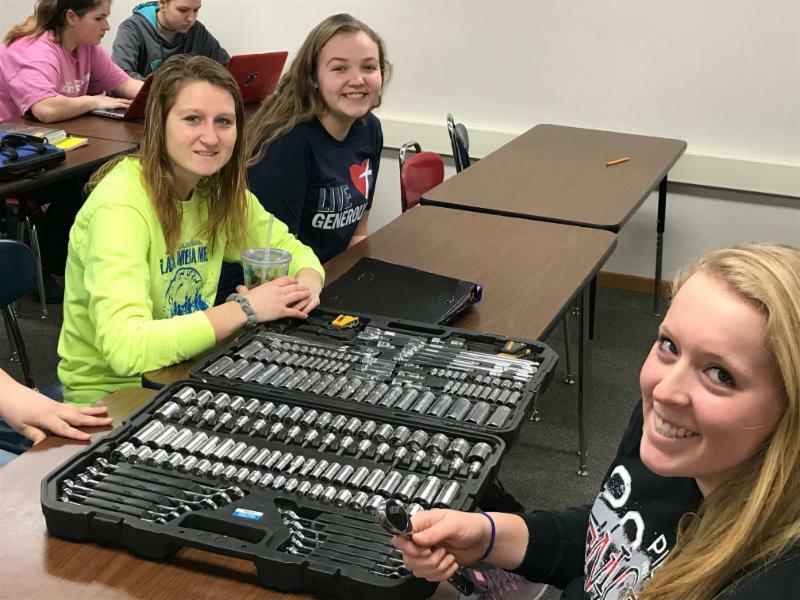 Repairing cracked screens, disconnected wires, missing keys and more--these students have saved the district money and learned a trade to boot! This year alone, they've repaired nearly 200 Chromebooks! 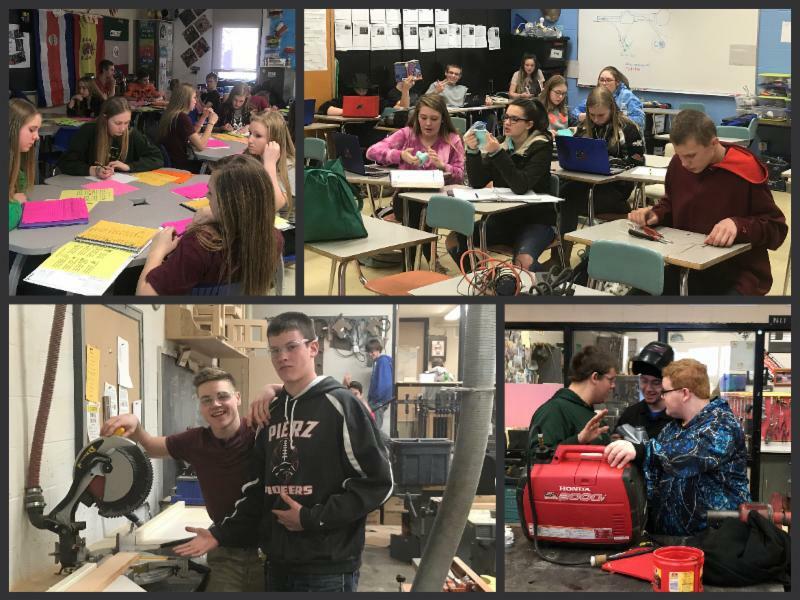 Mr. Paul Gruber rolled out a new class this semester, Women's Automotive, and the interest and efforts from Healy students is outstanding! This class will learn about car parts, functions, changing tires/oil, purchasing a car and more. Along with guest speakers from the industry, the all-female format is designed to empower our young women in the automotive field in a less intimidating beginner course. Awesome! Teachers are utilizing Tech Mobile to integrate 3D printers at the elementary and high school. They also learn about forces, motion, and transportation while they build and operate age appropriate cars. In addition to the 3D Printer they have used a Plasma Cutter, Engraver, Probes, Welding Stimulator, and CNC Woodmill. All thanks to a grant through NJPA and our hardworking teachers! I was raised in the Hillman area on a family dairy farm. 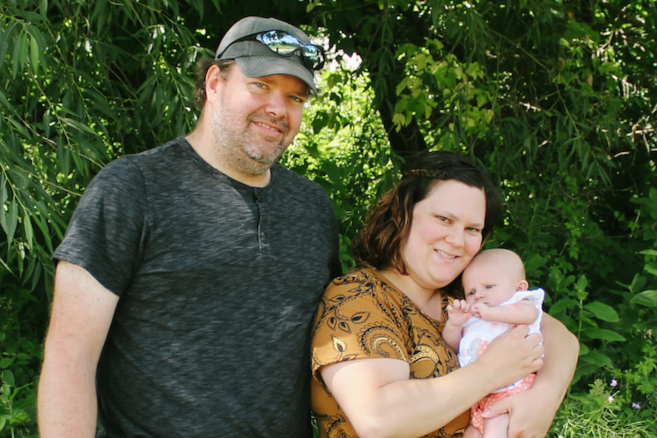 Growing up on the farm with my three sisters and brother, my Mom and Dad pushed us to work hard. Hi! 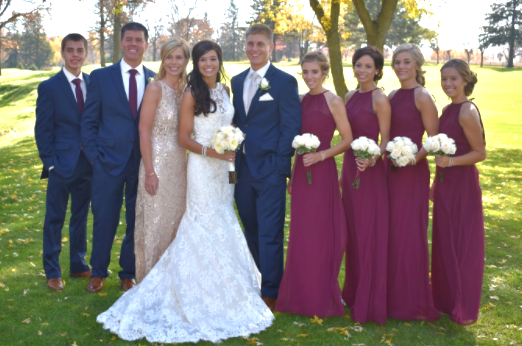 I am Becky Ruprecht, and I am a Title 1 teacher (alongside Tanya Thielen and the rest of the amazing speech, reading and special education teams!) at Pioneer Elementary. ​I love helping children learn, especially those who struggle. I was in title in 1st and 2nd grade and remember that special teacher, Mrs. Peach, who helped me learn to read. Her patience and hard work inspired me to volunteer with her during high school and I went on to become a special education and elementary teacher. 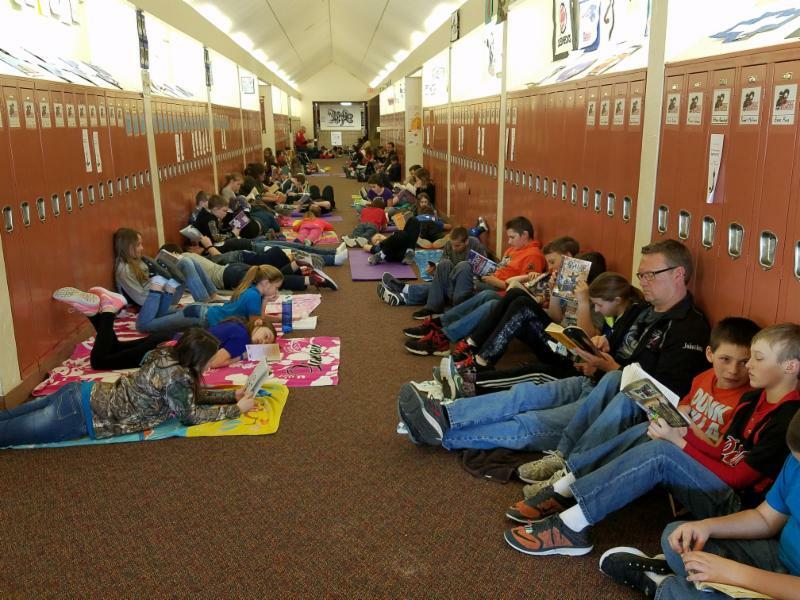 Pioneer Kicks Off "I Love to Read" Month! The entire school kicked off "I Love to Read Month" with Mrs. Dahl singing "Readin' USA" to the tune of the Beachboy's "Surfin' USA", and cheered loud when they learned that they will get to slime their principal when they meet their reading goals! 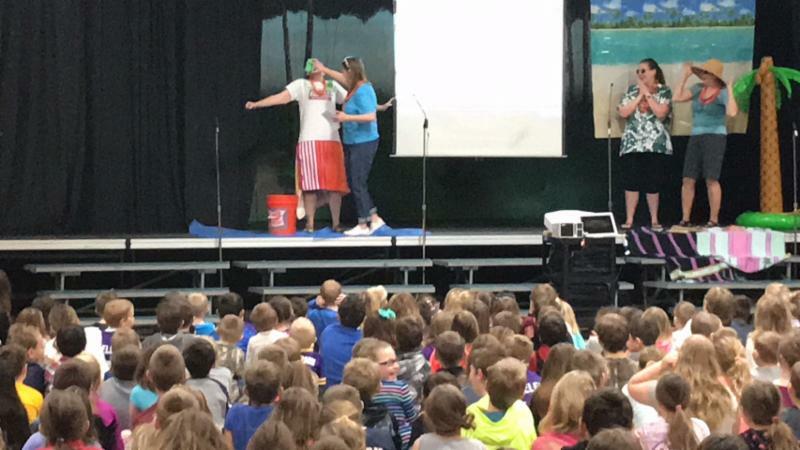 To show them how it's done, Ms. Jenny Dalsted slimed her sister, Ms. Nancy Dalsted to cheers and squeals of delight from all the Pioneer Elementary students! Fifth and sixth grade students helped make the "Take What You Need" and "Give What You Can" bulletin board. Students will be able to pick up a quote from the various pockets when they feel they need a little inspiration. They are also promoting a "Weekly Act of Kindness". Students are encouraged to complete the weekly task and get to add a sticker to the bulletin board once they do. 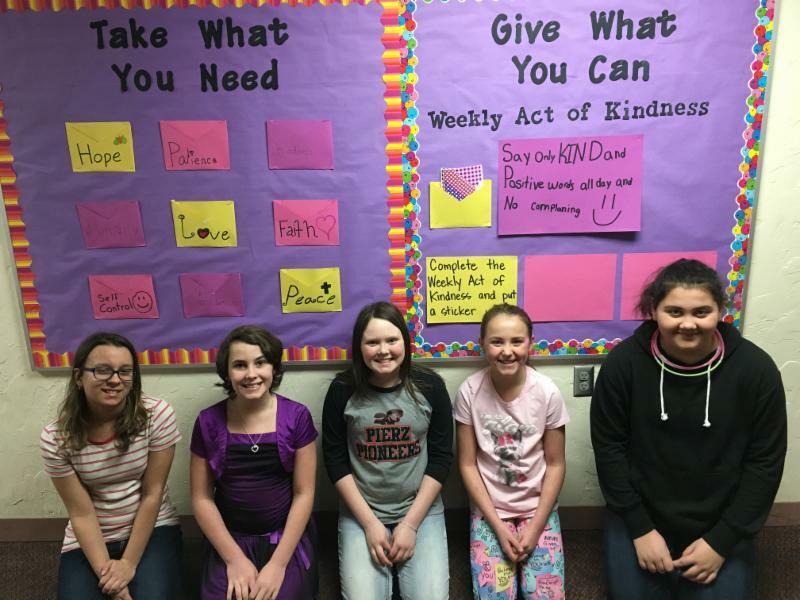 They also encouraged classes to make their own kindness poster, and you will find them posted throughout Pioneer Elementary. Wonderful! "Rapunzel, Let Down Your Hair!" 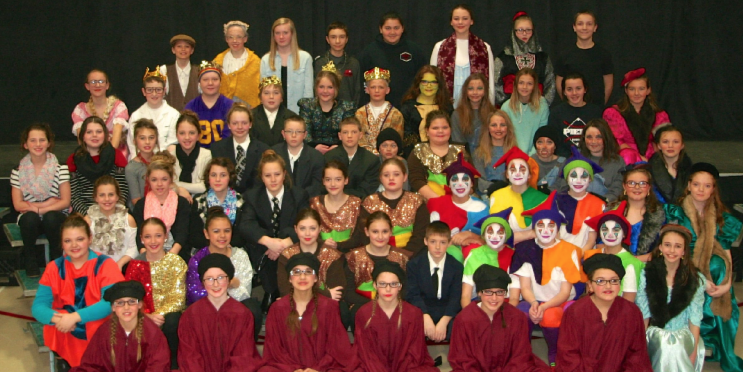 Students in grades 4-6 performed the musical, "Rapunzel, Let Down Your Hair" for parents, students and community members. Congratulations cast, crew, and directors, Mrs. Claybaugh and Mr. Kruse! 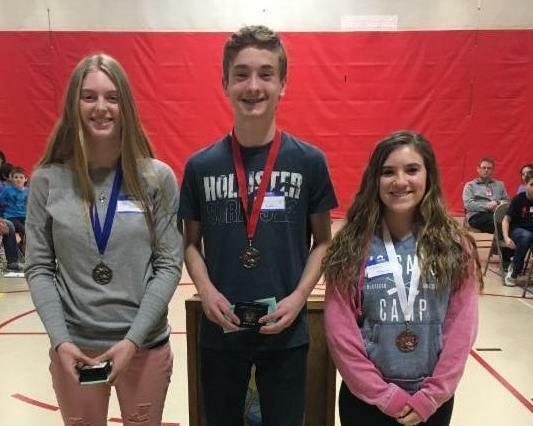 Featuring students in grades 5-12 selected by their teachers for being awesome humans. ﻿We wish we could feature ALL our hard-working students! 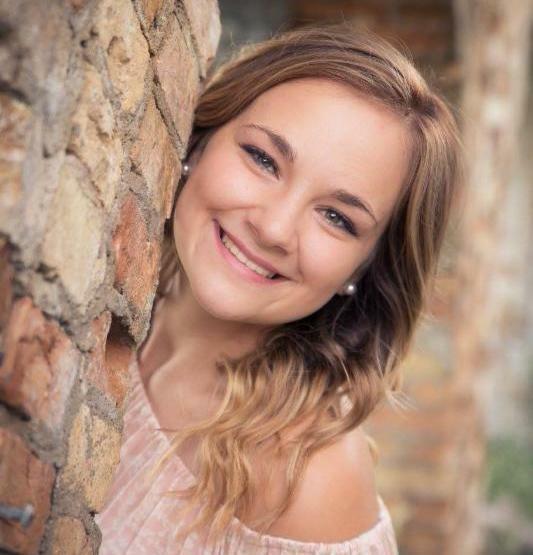 Nominated by Spanish Teacher Mrs. Kim Horning: "Emily Hedlund is a model student both in and out of the classroom. She always exhibits the utmost respect for her teachers and peers. She gives of her time and talent in Spanish Club, as a peer helper and as an academic tutor. Emily is compassionate, kind, patient and hard working. She always has a smile on her face and exudes positive energy. She is truly an inspiration!" Keep it up, Emily! If you have questions or would like to help support, please contact Sara Underhill, Art Club Advisor at 468-6458 x 1434.